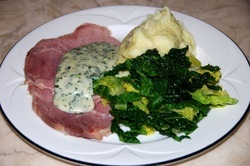 BACON AND CABBAGE and "SHAMROCK SAUCE"
Bacon & Cabbage with 'Shamrock Sauce"
In many homes across the world, particularly on St. Patrick's Day, people of Irish descent enjoy a "taste of home" ~ bacon and cabbage. And not just outside Ireland, in 2011 cabbage and bacon was voted the most popular meal in Ireland. The name bacon means different things in some other parts than the meaning of it in Ireland. To clarify: Bacon as used in this traditional dish is a "cured" pork joint taken from the shoulder or the back of the pig. Bacon in America is usually taken from the belly of the pig. So, if you want to replicate the dish as near as possible, ask your butcher for a shoulder of pork or a pork loin. There has been confusion for years about the use of corned beef rather than bacon (or ham). Years ago in Ireland the majority of the people would not have been able to afford beef and pork would have been the meat used as pigs could be kept more cheaply, and produce more readily, than the cost of keeping cattle. If a farmer had a cow at all it would have been kept for the milk, and resultant butter, it would yield and so would not have been eaten until its days of producing milk were over. Added to that the cow could produce a calf for the family to keep up the supply of milk. The corned beef confusion started properly after the mass emigration during and following the last famine in Ireland in the mid 19th century. Emigrants landed in America and found that beef was cheaper and more readily available than it had been in the Ireland they left behind. However, thrifty as they had to be, the Irish would "cure" any cuts of beef they got in the same way they had preserved their pork back home, resulting in corned beef, the 'corned' referring to the corns shaped kernels of salt used. In some recipes you will see the bacon is simmered for a short while and then oven cooked. In the old Irish way it would have only been simmered as obviously they had no ovens. So for this recipe we are sticking to the traditional method of cooking. In earlier times too it seems the cabbage was cooked for a very long time. Nowadays this is not the way we do it so we will skip the traditional way here and cook the cabbage much more to the way most of us are used to today. Some recipes call for the addition of baking soda to keep the cabbage green. There is no need to do this if you cook your cabbage the way we show you here. You can serve the bacon, cabbage and shamrock sauce alone or with some potatoes. Traditionally it would be potatoes washed and scrubbed and boiled in their skins, but mashed potato is good too. 1. Put the bacon joint into a pan of cold water together with the celery, carrots, and onions, and black peppercorns. 2. Bring to the boil. There is no need to change the water as most bacon/ham joints now are not as salty as once they would have been. 3. Place the lid on the pan at an angle so the pan is not entirely covered by it and turn the heat down and simmer for 30 minutes per 1lb/450g weight. 4. During the course of cooking regularly remove any white scum that appears on the top of the water. 5. Once the cooking time is up switch off the heat and allow the bacon joint to cool in the cooking water. This keeps the bacon joint moist. 6. Once cooled lift bacon/ham from liquid and drain. (Retain the liquid). 7. Cut off the rind and fat and cut into thick slices. 8. You can reheat the slices when ready to use by wrapping them in tin foil and popping in a hot oven for about 20 minutes. NOTE: With the cooking liquid left after some is taken out to cook the cabbage (see below), you could blend the cooked vegetables in the pot, heat the liquid again, add dried lentils and then you have tasty lentil soup. Cube some of the cooked bacon/ham and add to soup when serving. We are not sure if a sauce would have been traditionally used ~ there wasn't really much need as the bacon and the cabbage were and are delicious enough to stand alone without the help of a sauce. However, if there was a sauce used at all we think it might just have been parsley sauce as parsley grows so easily in Ireland. 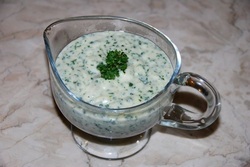 We have called in "Shamrock Sauce" after an internet friend, another Donegal woman, told us that as a child her father had always called parsley sauce shamrock sauce, asking the children to "pass the shamrock sauce". The result of this was that during her childhood she believed that her mother had made the sauce using shamrocks. We like the name and think it goes better with this dish so we will stick to "Shamrock Sauce". But please, just wear your shamrocks, DO NOT try to make a sauce with them! 1. Melt butter gently in pan. 2. Turn the heat down a little and add the flour into melted butter, stirring CONSTANTLY AND QUICKLY with your wooden spoon. The mix will bind together after a few moments. 3. Add about half the milk and keep stirring constantly, squashing any little lumps that appear with the back of the wooden spoon against the side of the pan. 4. Keep the heat low but enough to bring the sauce almost to a boil, stir constantly for 3 or 4 minutes to cook out the taste of the flour. 5. Add the chopped parsley and continue stirring for a further couple of minutes. 6. Add the salt and white pepper, taste and adjust seasoning if needed. 7. Your sauce is now ready to spoon on top of the bacon/ham slices. NOTE: If not using the sauce immediately it will thicken again when it cools. To reheat simply put over a gentle heat and warm up mixing with a wooden spoon all the time to prevent sticking or burning. If the sauce is thicker add a little milk to thin and keep heating until warm enough to use.